For other uses, see Dancing in the Dark (disambiguation). 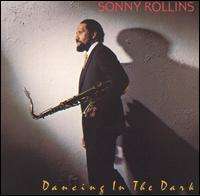 Dancing in the Dark is an album by jazz saxophonist Sonny Rollins, released on the Milestone label in 1987, featuring performances by Rollins with Clifton Anderson, Mark Soskin, Jerome Harris and Marvin "Smitty" Smith. The Allmusic review by Scott Yanow states: "Although not up to the level of his best live performances, this studio album is quite enjoyable and gives one a clear idea as to how Sonny Rollins sounded in the 1980s." ↑ Sonny Rollins discography, accessed September 23, 2009. 1 2 Yanow, Scott. "Dancing in the Dark > Review". Allmusic. Retrieved June 26, 2011.